From pre-K to post-grad, here are 5 of America’s greenest schools. “What makes a school green, anyway?” someone on the Matador team asked when I sent out an email asking for editors’ and interns’ favorite “green” schools in the US. It’s a good question, if not an easy one to answer. 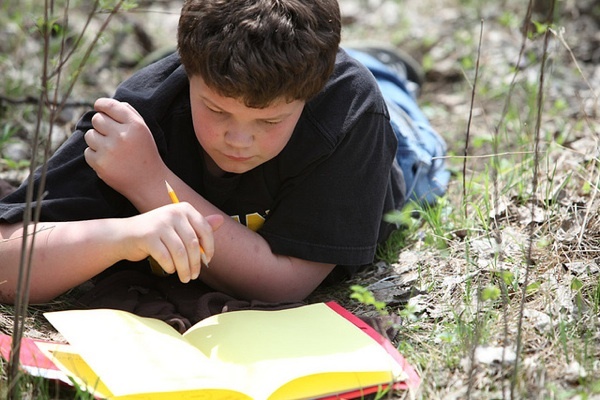 Is a school green if its curriculum focuses on environmental issues? Is a school green if it has a garden? Is it green if its cafeteria sources local food and composts the leftovers? Is it green if it’s built from the ground up and has LEED certification? How about if it’s an old building with a fall-out shelter, rescued and given new life as a school? Ideally, I think, a green school is one that has an environmental ethic evident in its construction, curriculum, and cafeteria, and the schools on our list fulfill these criteria. That being said, there was no rigorous scientific methodology devised to rate these schools in comparison to others; for that, consult The Princeton Review’s Guide to 286 Green Colleges, which is available in a complete version online– for free. MPES’ “greenness” is particularly important considering that its larger community is the result of urban sprawl; it’s one of Washington, D.C.’s “bedroom,” or commuter, towns. Although the schools are new builds, they were built within and are surrounded by Eastern deciduous forests, which are an extension of the classroom. Damaged landscapes that became part of the campus were replanted with native species. Rainwater is collected in roof barrels and is used for the schools’ flush systems, as well as some irrigation. The fact that the construction is recent also means that architects and builders could take full advantage of environmental design principles that are fairly novel, such as “physical daylighting models” (basically a fancy term for using windows and skylights to optimize natural light, which illuminates classrooms for more hours of the day than fluorescents). The school was just awarded LEED Gold certification earlier this month. I visited Edible Schoolyard, New Orleans (ESYNOLA, for short) in 2008, when ESYNOLA was just turning two years old. In many ways, ESYNOLA exemplifies the characteristics that make a school green. Students in grades K-8 helped convert a trash lot behind the school into a garden; last year, the garden yielded 2,900 pounds of produce, which was used for classroom lessons and cafeteria lunches. Students help plant, maintain, and harvest; their teachers craft lessons that promote hands-on learning. Kids learn fractions, for example, when making recipes in the Edible Teaching Kitchen. They help compost cafeteria leftovers and tend the green living roof of the outdoor classroom. “Through these experiences,” the school says, “students become stewards of our land and natural resources.” When I visited, teachers told me that kids shared lessons about environmental stewardship and healthy living with their parents, and that the school had been so successful that classroom attendance and participation had improved dramatically, as had parental involvement in the school. Not surprisingly, grades had shot up, too. 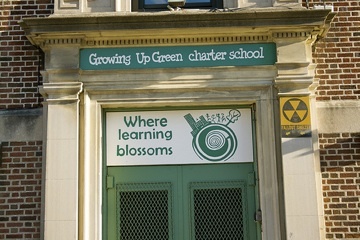 Growing Up Green Charter School is just a couple blocks from where I live, and it’s located in an old pre-war building that still has its fall-out shelter sign attached to its brick wall. It’s still a fledgling (it opened in September 2009), so it hasn’t realized all of its ambitious green plans just yet, which include ensuring that students’ uniforms are made of organic cotton and that classroom and student supplies, such as crayons, paper, and pencils are made of recycled material. From a building and design perspective, classroom furniture is made of either recycled or reused materials and walls are painted with non-toxic paints. School administrators, who eventually plan to serve kindergarten through fifth grade, envision teaching students that being green isn’t just about recycling, but about being mindful of the physical environment and the community at large. 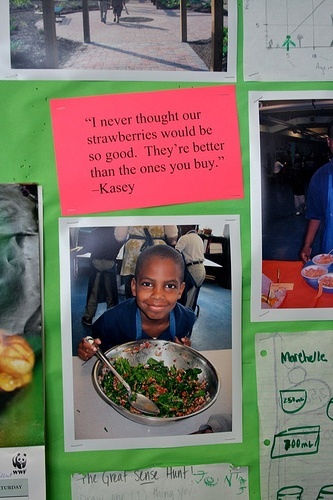 Growing Up Green is one of more than 200 “green” charter schools in the United States. I visited Warren Wilson in high school, when I was considering where I wanted to go to college. Way before being green was trendy, Warren Wilson was establishing a benchmark for what green education is. All students have 15 hours of work study each week; much of that work is done on Warren Wilson’s farm, a mixed-crop and livestock operation that supplies the college cafeteria, as well as local families (the latter through a food co-op and on-campus Farmers’ Market) with antibiotic and hormone-free meat, as well as organic produce. It’s been recycling for years and has had a composting system since 1990. The college continuously implements energy-saving projects, including solar-powered walkway lights and real-time energy use monitoring systems. While the school has degree-granting programs in major areas like Sustainable Agriculture and Conservation Biology, Warren Wilson is also well-known because of its competitive and highly-respected MFA program for writers. Take a peek at Sterling’s website, which has granola written all over it. In terms of traditional green practices, Sterling faculty, staff, and students have been recycling for more than three decades. Their barns are solar- and wind-powered. The dining hall doesn’t use disposable dishes or trays, all leftovers are composted, students can dry their laundry on outdoor clotheslines, and the campus offers a bike-share program. It sounds like the right place for Tim, for sure, and I wish I’d known about it when I was looking for schools (though I’m not sure I could tolerate the tough Vermont winter). Know of a green school in your community? Share the name and some details in the comments!